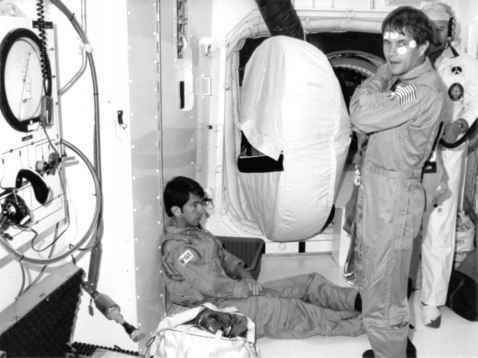 Lenoir (foreground) and Allen (rear) are assisted in their translation across the mock-up Shuttle payload bay in the WETF at JSC during training for their planned, but subsequently cancelled EVA on STS-5. 16 November, on the concrete runway at Edwards Air Base in California. The SBS-C business communication satellite was successfully deployed during the sixth orbit some eight hours into the mission, while the second Comsat, Canada's Anik C-3, was deployed on orbit twenty-two. 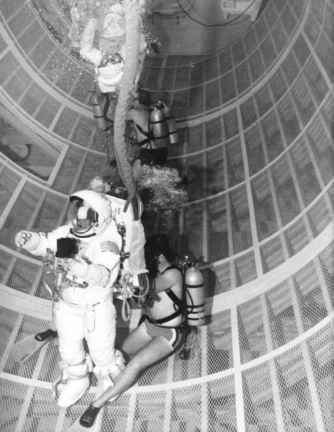 A planned EVA demonstration was at first postponed due to crew illness, then cancelled due to faulty equipment. The nausea episode suffered by both Overmyer and Lenoir was published and endlessly discussed by the media, much to the annoyance of the crew. The openness of private medical matters was becoming an irritation to the astronauts as a group and plans were being devised to amend the reporting of such incidents from STS-6 onwards, unless it threatened the mission. Proud of their satellite deployment success, the crew posed for an in-flight crew portrait with a card advertising the fast and courteous satellite deployment service provided by the "Ace Moving Co'', whose motto was "We Deliver''. 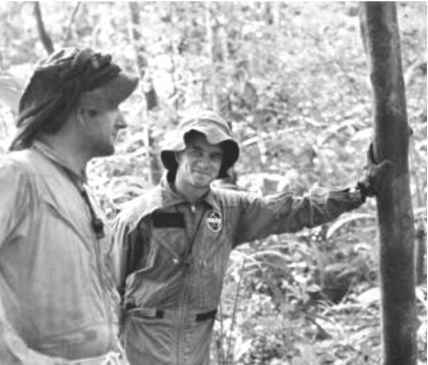 Lenoir (seated) and Allen, who is wearing electrodes for monitoring his reflexes during launch as part of Bill Thornton's biomedical tests. They are waiting to enter Columbia via the side hatch on 11 November 1982.